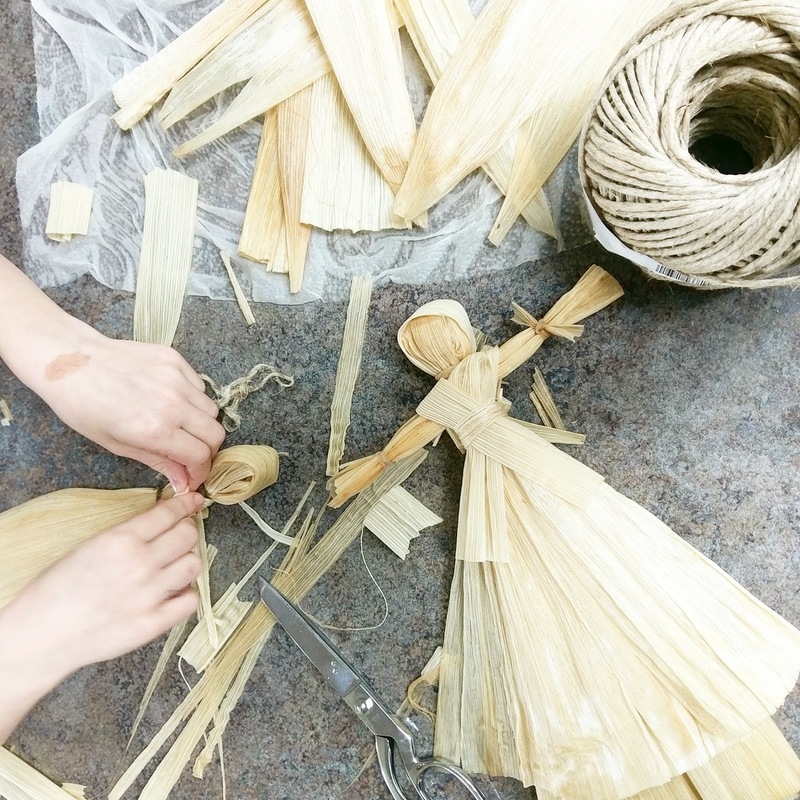 Last week we made these cute corn dollies. We made them as part of our celebration of Imbolc. This was my first time making these and they were so much fun! 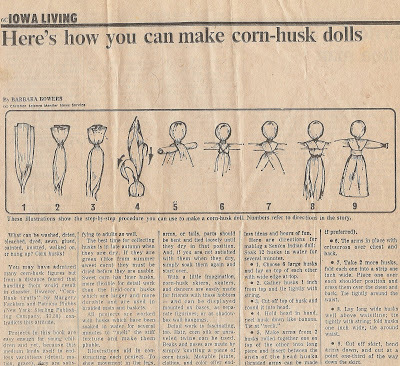 I was surprised by how easy they were and how much you could do with the cornhusk to add your own touch to each doll. I remember my grandmother having these around the house. I never paid much attention to them until Isabella and I made them this past week and I am convinced that the ancestors who made these dolls found great joy in making them too. We set the dolls up next to the DIY Beeswax Candles that we also made last week. The color combinations worked great together. I had extra cornhusk from when we made tamales. You can find my recipe on the blog. Pork Tamales--I have also made the tamales vegan by using black quinoa, chick peas, and veggies. I think this is definitely an older childs project. Isabella is 10 and she had trouble tying some of the knots and holding the cornhusk parts together. Dexterity with both hands helps because you have to hold and tie things and this was frustrating for her because things kept slipping. The other option is to have a helper that can hold the doll while the other is tying the head, the skirts, and other pieces onto the doll. Below I am sharing several of the many instructions that I found to make the dolls. The basic concepts were all the same. Start with a head, add arms, and then the body or skirt. You can embellish the dolls with capes, bonnets, braided arms, fancy dresses, criss-cross bodices...the list of ways to make your final doll are endless. We pulled the pieces apart and spread them out according to size. Some pieces are great for the skirt because they are long and wide. Other pieces are smaller and work well for arms, bonnets, or the head. I bought thin twine to help secure the heads and the skirts. 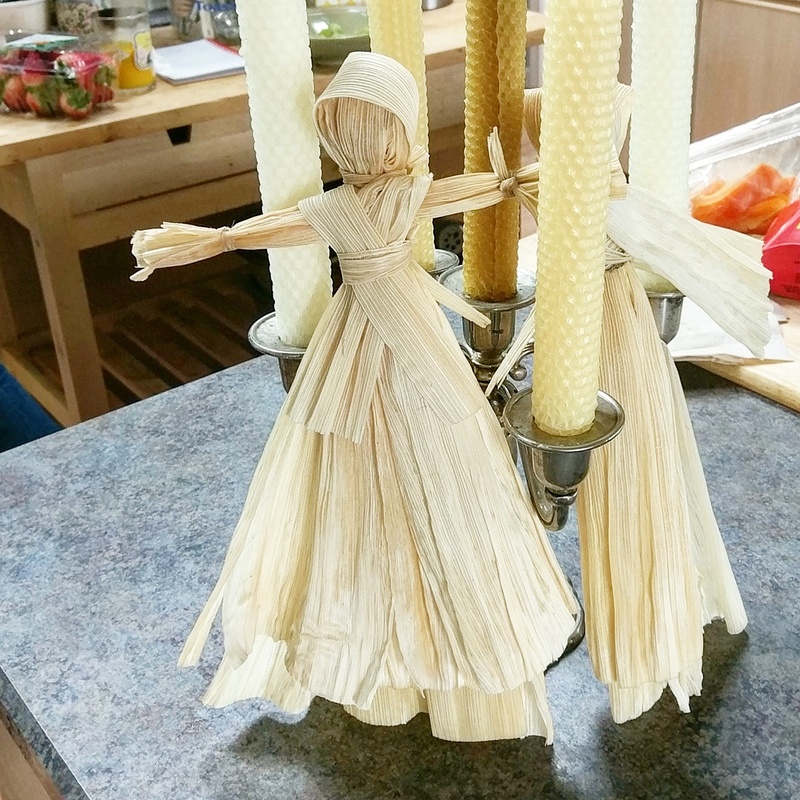 You can use thin pieces of the cornhusk but with the kids it was easier to have something sturdy. Sometimes the cornhusk strips break. 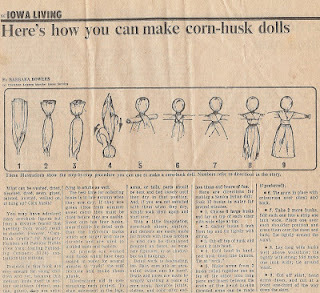 We used the instruction sheet from the Iowa newspaper and made our doll. The project took us an hour to complete. Not because it was hard but the initial decision of how we wanted to make our dolls took some time. Overall, I will be doing this again. Our dollies dried quickly and they look adorable set out. We will keep them up until fall when we harvest our vegetables and then burn them as a thank you for watching over our crops.